After the success of last years St Patrick's Day Ceilidh, the Friends of the Brontë Parsonage Museum will again be celebrating the event. This year the ceilidh will be held in The School Room, Church Street, Haworth where Patrick Brontë himself started a Sunday School and Charlotte Brontë taught. The ceilidh is on Saturday 15 March from 7.30pm until 11pm - and once again the music will be provided by popular band Northern Comfort. There will be a licensed bar and the ticket price includes a pie and peas supper. Tickets are available from the Museum Shop or by ringing and cost £8.50 for adults and £3.50 for children. Why not come along and have a great night out and support the work of the Museum at the same time? The first ever Headingley LitFest takes place soon, beginning on Wednesday 12 March with an illustrated talk by Nicolette Jones, who is not only the children's book reviewer for The Sunday Times, but the author of a biography of the Victorian philanthropist Samuel Plimsoll and his campaign on behalf of sailors The Plimsoll Sensation (Little, Brown) which was published in 2006. The name of the book is the name of the talk, which will be delivered in Headingley library at 7pm on Wednesday 12 March. Saturday events in the LitFest include Tea with the Brontës - which will begin at 4pm in the New Headingley Club in St Michael's Road. The audience will be able to sip tea and consume cakes, listening at the same time to a talk by Bob Barnard entitled People the Brontës Knew, based on A Brontë Encyclopedia by Bob and Louise Barnard (Wiley-Blackwell, ISBN: 978-1-4051-5119-1) which was published in July 2007. Headingley is part of Leeds, a city about twenty miles from Haworth. Headingley is well-known for its stadium (cricket and rugby) but not so well-known for its literary connections: Arthur Ransome (Swallows and Amazons) was born there, before being sent to school in the Lake District, Alan Bennett (History Boys) lived over his father's butcher's shop there, J R R Tolkien (Lord of the Rings), who before Oxford was a professor at Leeds University, had a terrace house on the Otley Road and Kay Mellor (Ring of Gold, television version of Jane Eyre) lives there today. For full details, go the Headingley LitFest. Patrick Brontë (1777–1861) was the father of the famous ‘Brontë Sisters,’ Anne, Charlotte and Emily, three of Victorian England’s greatest novelists, but he was a fascinating man in his own right and not nearly such an unsympathetic character as Elizabeth Gaskell’s Life of Charlotte Brontë would have us believe. Born into poverty in Ireland, he won a scholarship to St John’s College, Cambridge, and was ordained into the Church of England. He was perpetual curate of Haworth in Yorkshire for forty-one years, bringing up four children, founding a school and campaigning for a proper water supply. Although often portrayed as a somewhat fobidding figure, he was an opponent of capital punishment and the Poor Law Amendment Act, a supporter of limited Catholic emancipation and a writer of poetry. 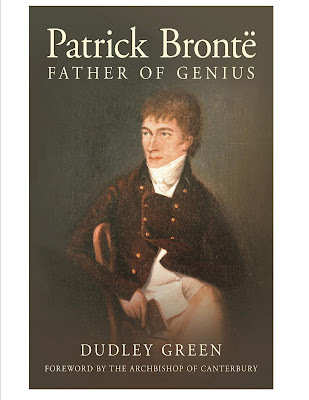 This is the first serious biography of Patrick Brontë for more than forty years. No Coward Soul is the new and special exhibition at the Brontë Parsonage Museum celebrating the life and work of Emily Jane Brontë. For the very first time members of the public are invited to come and view our entire collection of objects and artefacts associated with the world famous Brontë sister and author of Wuthering Heights. The exhibition guides our visitors through the most significant aspects of Emily’s life: her childhood, her love for animals, her writing, and how she felt about spending time away from her home here at the Parsonage. We have chosen to display some very special and rare objects belonging to Emily to accompany the information about her life. We hope that visitors to this unique Emily exhibition will gain a deeper insight into the life and soul behind the legend. The Brontë Parsonage Museum is open seven days a week. Please contact the museum on 01535 642323 for information on opening times and entry charges or Ann Dinsdale - Collections Manager on 01535 640198, for information on the No Coward Soul exhibition 2008.